In the journey to digitalizing trade, blockchain and distributed ledger technology (DLT) have emerged as powerful technologies promising to bring tremendous new opportunities for trade finance. 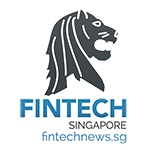 At the 2018 Singapore Fintech Festival, experts discussed the many opportunities that blockchain brings to the table, with Jim Sullivan, deputy assistant secretary for services at the US Department of Commerce of International Trade Administration, citing two core areas for blockchain: trade finance and supply chain. Sullivan spoke about an advisory committee for the US Secretary of Commerce that is working to evaluate different standards across the world and the feasibility of leveraging blockchain in trade finance. Similarly, supply chain is heavily paper-based and inefficient with multiple interventions in the process. As such, there is tremendous opportunity in these two areas. Trade finance is currently full of inefficiencies. According to GTReview, a trade finance deal for a single commodities cargo by sea can require up to 36 original documents and 240 copies from as many as 27 parties. It can often take weeks, if not months, to complete. When applied to trade finance, blockchain allows for real-time monitoring by multiple parties and the exchange of documents in a digital, secure and decentralized manner, enabling thus streamlined international trade transactions. By allowing both greater confidentiality and the ability to keep a closer tab on the flow of the goods and documentation, blockchain can also help fight fraud and make it harder, for example, to repeatedly mortgage the same shipment. 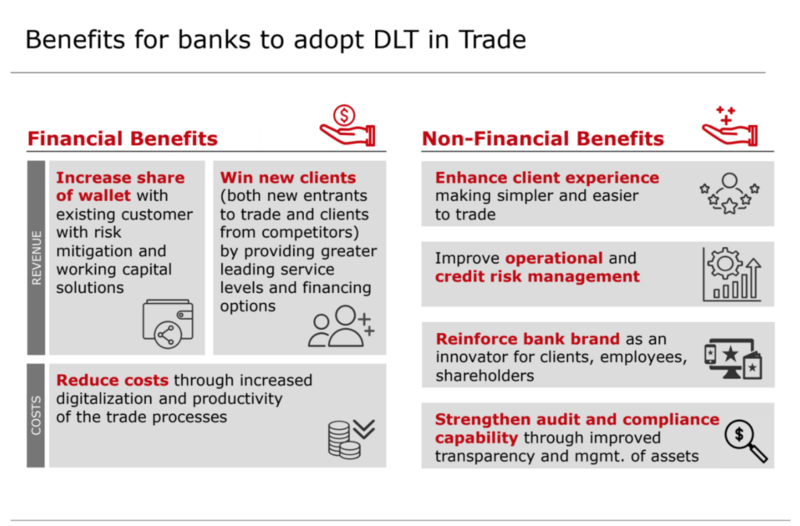 Compared to existing trade products and services, DLT-based trade platforms are an attractive value proposition to clients, promising revenue growth and cost optimization, according to Sen Ganesh, Partner at Bain & Company. Among the key advantages, blockchain can enhance risk mitigation, provide faster settlement with cheaper and faster working capital financing, reduce fees and tariffs, and act as one-stop solution for all trading needs (marketplace, tracking, eBL, advisory, etc.). 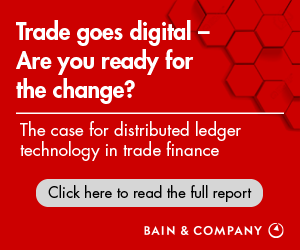 Bain & Company estimates that adopting DLT documentary trade in the banking industry could enable a whopping US$1-3 billion revenue uplift per annum, or between 15% and 40%, and a US$400-600 billion in cost savings yearly. The firm predicts that blockchain will fundamentally shift trade volumes from 2016’s US$16 trillion to US$24.8 trillion in 2026. The new revenue streams will notably come from the US$1.1 trillion worth of new trades enabled by removing barriers, and the US$900 billion worth of traditional documentary trade moving to DLT’s better service levels and lower fees. But for banks, adopting blockchain in trade does not only mean financial benefits through client acquisition, increased share of wallet with existing customer, and reduced costs. It also means enhanced client experience, improved operational and credit risk management, reinforced bank brand and strengthened audit and compliance capability through improved transparency and management of assets, the firm says. Banks have recognized the potential of blockchain and invested heavily in DLT-based networks. Marco Polo is a collaboration between TradeIX and R3 that has partnered with some major financial institutions including RBS’s NatWest, BNP Paribas, Commerzbank, and ING. The collaboration combines R3’s Corda Enterprise solution and TradeIX’s TIX Core, an open infrastructure powered by DLT to streamline accounting for businesses to track payment guarantees and expedite receivable discounting. The Hong Kong Trade Finance Platform (HKTFP) is a venture led by the Hong Kong Monetary Authority (HKMA) with technology support from the Ping An Group. There are 21 banks reportedly on board including HSBC and Standard Chartered. HKTFP digitizes supply chain record-keeping and connects with other trade platforms to further facilitate cross-border trades. Already, we are seeing deployments of blockchain applications and infrastructures in trade finance. Major developments occurring in the past year are hinting that commercialization may be closer than we think. HSBC unveiled earlier this month that it had settled US$250 billion worth of transactions using blockchain technology through its FX Everywhere foreign exchange platform. HSBC completed its first blockchain trade finance transaction in May 2018. We.Trade is a trade finance initiative by banks that include HSBC, Deutsche Bank, Rabo, KBC, Nordea, Santander, and Societe Generale. It focuses on small and medium-sized enterprise (SME) trade finance in Europe using Hyperledger Fabric. The platform went live in July. Komgo, a venture founded in August 2018 by a group of global banks and commodities players, went live with its commodity-focused blockchain platform in December 2018. Komgo aims to change the way financiers transaction with clients and other parties in the ecosystem by improving the speed of conducting transactions. Benefits include the ability for all parties to monitor the operation’s progress in real time, easy data verification, reduced risk of fraud, as well as shorter cash cycle. In December, the China Banking Association (CBA) launched the China Trade Finance Inter-bank Trading Blockchain Platform, which aims to enhance efficiency by standardizing and digitizing transaction information between banks. ICBC and China Merchants Bank verified the first inter-bank domestic letter of credit on the DLT-based platform. In November 2018, BNP Paribas became the third bank to conduct a live trade transaction on the Voltron blockchain platform in a pilot project. The platform is expected to begin operating in 2019. That same month, HSBC India and ING Bank jointly executed a blockchain-enabled, live trade finance transaction jointly with Reliance Industries and Tricon Energy. 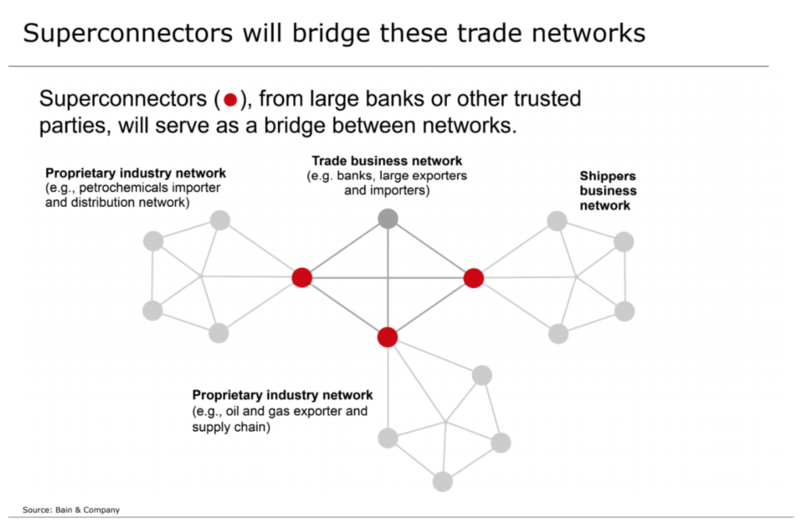 But for blockchain to realize its full potential in trade finance, industry participants will need to agree on business networks with common standards and business rules, Bain & Company says, adding that certain institutions such as large banks, government agencies or other trusted parties will need to play the role of “superconnectors.” These will serve as bridges among business networks to share critical information. As adoption of blockchain accelerates and moves into commercialization, the industry is now witnessing early signals of consolidation, Bain & Company says. In October, CaixaBank, Erste Group and UBS left the Batavia blockchain consortium to join We.Trade. Batavia ceased to exist but according to players involved in the initiatives, the move represents a decision to merge the two platforms, rather than shutting Batavia down. The firm says that it is now critical for banks to be actively engaged in the changing trade ecosystem, adding that innovators, compared to fast followers and market adopters, will likely gain market share.